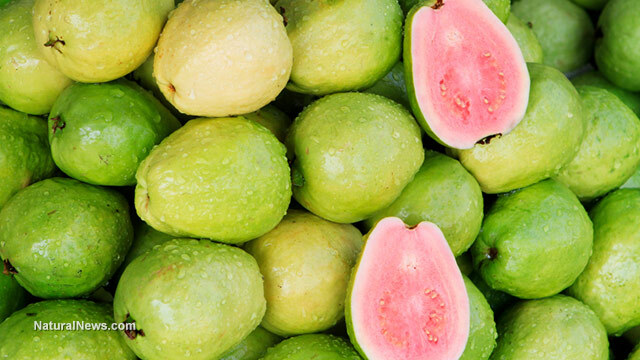 (NaturalNews) Guavas are native to South America, Mexico and other parts of North America. They are cultivated in the tropics and subtropics of Africa, the Caribbean and parts of Asia, Hawaii, New Zealand, Australia and Spain. There are different species of guava, but the most commonly eaten guava is known as the "apple guava" followed by the "pineapple guava" and the "strawberry guava"; there are tiny white flowers that grow on guava trees, which have five petals and multiple stamens. The outer skin is either rough and bitter or soft and sweet. A ripe "apple guava" has light-green skin and a pink inside. There are seeds in the middle of the guava and pulp that may be sweet or sour, depending on the variety of guava harvested. Guavas do not thrive in temperatures less than 25 degrees Fahrenheit; thus, the plant thrives best in a tropical or subtropical environment. These exotic fruits may be consumed raw and should be cut into quarters or eaten in a similar fashion as an apple. In Pakistan, it is the winter fruit of choice, and in Asia, guavas are added to plum sauces or other marinates. Guavas may be candied or made into jellies, jams or marmalades. And in Trinidad, their bark and leaves are used to make tea and medicine. The guava fruit is rich in both vitamins A and C and contains antioxidants, carotenoids and polyphenols; therefore, the guava is good for one's vision and has anti-aging benefits for the skin. Their leaves and bark have antimicrobial properties and are rich in fiber and have four times the amount of vitamin C as oranges, which helps boost the body's immunity and protects it against pathogens that cause infection. Guava also improves the function of the thyroid glands, which regulate metabolism, and it is good for diabetics since it has a low glycemic index. It is also high in fiber, thereby preventing constipation. This tropical fruit has folic acid or vitamin B9, which is good for pregnant mothers. And it may lower high blood pressure, since it reduces cholesterol in the blood. Lastly, it contains magnesium, vitamins B3 and B6, which helps relax the nerves and improves blood circulation to the brain, accordingly.